Is the Israel Museum’s Birds’ Head Haggadah Nazi-era loot? The Birds’ Head Haggadah, by the scribe Menahem, southern Germany, around 1300. According to the Israel Museum it was "in the possession of Ludwig and Johanna Marum, Karlsruhe, Germany, until the Nazi epoch"
A 13th-century book used in the celebration of Passover, now in the collection of the Israel Museum in Jerusalem, is at the centre of an ownership row. The manuscript, known as the Birds’ Head Haggadah for its colourful illustrations, was once owned by the family of the German-Jewish politician Ludwig Marum, who was an early victim of the Nazi regime. His heirs are pushing to have their title to the work recognised and receive compensation, but they say they want the book to remain on public view at the museum. The manuscript, dated to 1300, is a work in pen, ink and tempera on parchment by a scribe named Menahem fr om southern Germany. 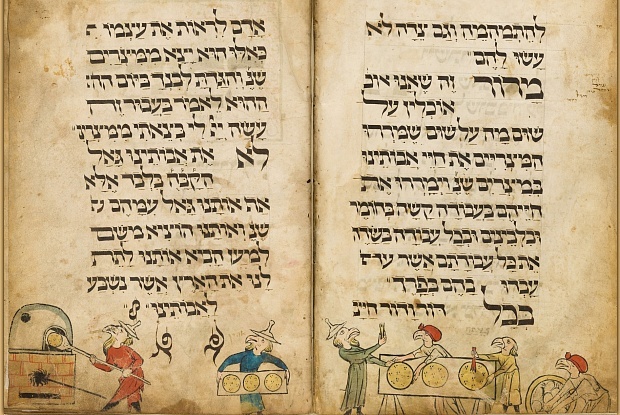 It is described by the museum as the earliest Ashkenazi Jewish illuminated Haggadah. Parts of the book were reproduced in full colour in the popular edition The Medieval Haggadah: Art, Narrative, and Religious Imagination, published by Yale University Press in 2011. In a postcard sold in the museum gift shop, two pages fr om the manuscript show bird-headed figures preparing matzoh for Passover. The book was the property of the family of Johanna Benedikt, who married Ludwig Marum, a lawyer based in Karlsruhe. He was a member of the Social Democratic Party, which opposed Hitler, and served in the Reichstag from 1928 until 1933. He was arrested in March of that year and later transferred to Kislau, a Nazi concentration camp, where he was strangled in late March 1934—although his death was reported as a suicide. Marum’s three children fled Germany after 1933, to the US, Mexico and France. Today, Marum is remembered as an early victim of the Nazi regime and a high school in Karlsruhe is named after him. In 1946, the haggadah was sold for $600 to the National Bezalel Museum in Palestine by Herman Kahn, a Jewish refugee who had been a teacher in Karlsruhe. The purchase was covered in the local press at the time but it is not clear how Kahn obtained the book. The Bezalel Museum was later incorporated into the Israel Museum, wh ere the manuscript was reproduced in a catalogue, shown with a plaque noting that it was “in the possession” of the Marum family before the Nazi Era. Eli Barzilai—born Ernst Peter Marum in 1941, and adopted by an Israeli family—said there is no longer a plaque that names the Marum family near the manuscript. The museum’s website, however, does mention Ludwig and Johanna Marum’s possession of the manuscript. Speaking for the family, Barzilai said the heirs are asking for “less than $10m” and he put the manuscript’s market value at several times that amount. He added that the family would rather the haggadah remain at the museum. The Israel Museum did not respond to The Art Newspaper’s requests for comment. In a 31 March email to Schoenberg, the museum’s lawyer said: “There is no dispute that the Haggadah was owned by the Marum family for a period of time up until 1933. There is also no dispute that the Haggadah was in the hands of Mr Kahn in 1946 and that the Museum acquired the Haggadah from him.” The museum also requested documents from the heirs tracing the haggadah’s ownership after 1933.